Cracked or peeling paint can occur on cedar siding for a number of reasons, according to William Feist of the Western Red Cedar Lumber Association. When the wood goes through a series of wet-dry periods, the paint and finish are stressed and the paint can crack. Peeling and cracking can also occur from incorrect application procedures. Lack of primer and improper preparation of the cedar surface can result in weak bonds between the cedar and the paint. Regardless of the reason, you must remove severely cracked and peeling paint before you can refinish or repaint the cedar siding. Scrape and peel away any loose or cracked paint that you can remove easily. 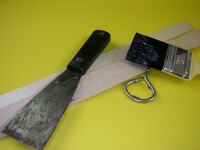 Work with the flat edge of your plastic or metal scraper--do not use the sharp points, or you risk scratching the wood. Apply paint stripper to the cedar siding. Many of these products come in cans or bottles much like paint. Apply the stripper to the siding with a paintbrush, or spray it on if it comes in a spray bottle. Follow all product instructions regarding the amount to use and the proper time to wait. Allow the paint stripper to settle onto the surface for the time recommended on your product’s instructions; this can be as little as 15 minutes or up to 24 hours. Waiting the appropriate time will allow the paint stripper to effectively dissolve the old paint or break the bond between remaining paint and the cedar surface. Scrape newly loosened paint from the cedar surface. Repeat the application of paint stripper, then scrape as necessary to remove all the paint. Sand the cedar surface lightly with medium-grit sandpaper (190 to 265 grit) to remove small remaining paint spots. Rinse the cedar surface in clean water to remove dust from the sandpaper as well as any remaining paint stripper. There are a variety of paint stripper products that are safe for use on cedar siding. If in doubt about the type of product to use, consult an expert at a hardware or home improvement store. If your paint stripper product does not indicate that it is non-toxic, wear a respirator and protective gloves when applying the product to your cedar siding so you do not inhale or come in contact with harmful chemicals. Do not use a power washer or any similar cleaning product to remove paint from your cedar siding. These high-pressure tools will damage the wood.